This mod enables reseeding on crops and orchards. Depending on the plant, it will begin potentially reseeding at 70-90% growth, and different plants are more likely to reseed than others. Wild crops can be harvested using the "Clear Wild Crops" tool, added to the removal toolbar. Because wild crops get started so late in the season, it is unlikely they will fully mature before frost hits, although they can be harvested anyway for a small immature yield. 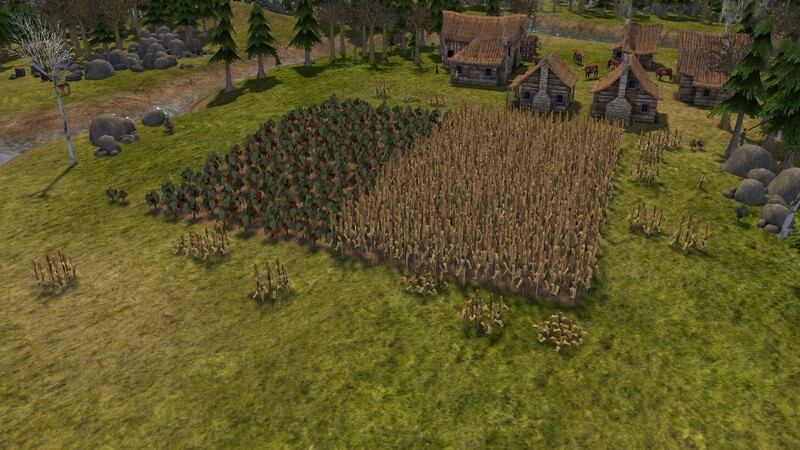 Because your citizens will harvest crops as soon as they're ready, you will usually only see a few wild crops pop up. However, if a crop is deliberately not harvested, the effects are much more noticeable, especially if they matured early. Note that wild fruit trees do not bear any fruit and are only good for wood (or aesthetics). Cheaty difficulty? Maybe a little bit. It may be more trouble than it's worth to send your laborers out to collect a bunch of stray, immature wild crops before frost hits, but it can help a bit in a pinch. It's more of an aesthetic mod. - A slim potential for wild crops to begin a new wild strain which will overwinter. Conflicts: None that I'm aware of. It would conflict with any mod that makes crops grow faster or slower, if any such mod exists. - I later realized that this mod conflicts with mods that change the lifespan on orchard trees. I have updated the mod to match CC's tree lifespan.